Commercial airlines have made great strides in beating their customers into dead-eyed submission, thanks to high ticket prices, endless add-on fees, technical glitches, and unpleasant customer service. But just in case that’s enough for you, these sadists are increasingly mishandling luggage, too. 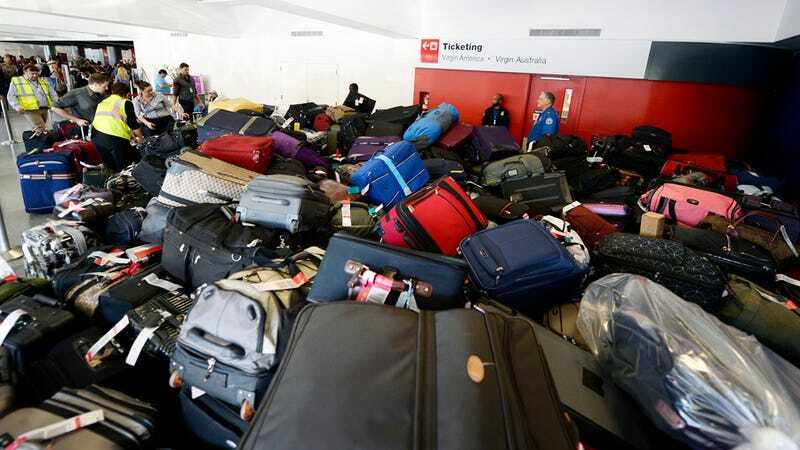 Most of those bags — roughly eight in 10 — were simply delayed, according to a report from SITA, an aviation communications and technology company that tracks baggage performance. More than one in 10 are damaged or rummaged through and 5 percent are just permanently stolen. That number is up from the halcyon days of 2013, when SITA reported that airlines mishandled a mere 21.8 million bags — oh, how we long for such a kinder, gentler time. And should some sort of baggage misfortune come between you and your stuff, godspeed: The latest SITA study says it takes a day and a half to for customers to be reunited with lost or misplaced bags, which is 2.5 hours longer than it took in 2013. With statistics like these, combined with ever-rising checked baggage fees, it’s a wonder we let our bags out of our sight at all. But checking bags is often unavoidable and airlines know this, hence their death grip on our figurative balls. And far be it from the justice system to do much of anything about airlines’ continual and relentless mistreatment their customers (though the DOJ just might look into it, bless their hearts). The only big win for The People as of late has been an inconsequential fine handed to Delta for time and expenses associated with the investigation of a baggage-fee collusion case from 2008 (which is still ongoing, because slow and steady wins...nothing, actually); Delta was slapped with a $2.7 million bill. But for a company that brought in $860 million in checked baggage fees for 2014 and scored an overall net profit of $659 million, $2.7 million stings about as much as an eyelash falling on the cheek of a giant.